If every adult in Benzie County donated $300 right now, we could send every 2016 high school graduate from both Benzie Central and Frankfort to college. Chew on that a minute, would you? “Talk about an excellent way to spend less than a dollar a day,” says Matt Stapleton, principal at Frankfort High School. Programs that unilaterally give money to students just for graduating—oftentimes regardless of grades or class standing—are called “Promise” scholarships. These programs have been cropping up far and wide over the past decade, but Michigan has more than a dozen Promise scholarships, which is the most of any other state in the nation. The programs have a wide range when it comes to the amount that is awarded: the Baldwin Promise, for instance, gives a total of $5,000 per year for four years to each student, whereas the Kalamazoo Promise gives the entire cost of tuition to any Michigan public school and a handful of private schools, too. A college degree costs more than double what it did a generation ago, according to Bridge Magazine, even after taking inflation into account. And prices are rising all the time—in 2015, tuition rose an average of 2.78 percent at Michigan universities, according to MLive. *Tuition, fees, room & board, books, supplies, other expenses, before any financial aid is assessed. In Baldwin, a very small school district, they have seen college attendance increase from only 12 of the 32 graduates in the class of 2005 to nearly everyone from the class of 2015. In Kalamazoo, a very large school district that graduates more than 500 students each year, they saw an additional 1,000 students enroll within the first year of the Promise’s implementation, and the student population has increased by close to 3,000 students since 2005 when the program was first announced. Every school district gets $7,250 per pupil per year in funding from the state. In Kalamazoo, the increase in the student population has allowed the district to hire more than 100 new teachers; they have upgraded facilities; they have passed bonds to build new schools. Moreover, researchers have found that Kalamazoo Promise students are one-third more likely to graduate from college within six years of finishing high school than their pre-Promise peers. Additionally, the Promise brings in close to $5 in benefits for every $1 invested, based on the projected increase in wages over 30 years for students who otherwise would not have graduated from college. In the case of Kalamazoo, the Promise money came from “anonymous” wealthy donors, though many people think it was the Stryker family or perhaps even Derek Jeter. But in Baldwin, the money came from the people. Over breakfast at a local restaurant one nondescript day, Richard Simonson told his friends that they should all start asking everyone they knew to give some money so that local kids could go to college. And that is just what they did: they asked everyone—even school employees and summer residents—to donate $500. If you were not able to pay it up front, you could get on a payment plan. They raised $160,000 in a year. So what does all of this mean for Benzie? Well, there are roughly 13,500 residents of Benzie County who are 21 years of age or older, according to 2014 estimates from the U.S. Census. If each of these adults donated $300, that would total more than $4 million to be divided among the roughly 150 students who will be graduating from Benzie Central and Frankfort schools on Sunday, June 5. If divided equally among them, each student would walk away with $27,000 from that $4 million pool, which is enough for one year at the University of Michigan, the most expensive public school in the state, before any other type of financial aid or scholarships are taken into account. Imagine what a program like this could do for our kids. Imagine what a program like this could do for our school districts. Imagine what this could do for our local economy, bringing young families to Benzie County to live, work, and play—making money here, spending money here, increasing the tax base here. “This is a great idea for attracting young families to our community,” says Scott Kubit, who has been teaching at Benzie Central High School for nearly two decades. A Promise program can come in many shapes or sizes, and the $300 amount that is suggested in this article is just that—a suggestion. And by no means am I trying to belittle the work of so many local organizations who donate close to $100,000 in scholarships to students at both schools each year. Rather, my hope is that this idea gets the wheels turning in the heads of some of Benzie County’s movers and shakers. A Benzie Promise might not be the solution to all of our woes, but it should—at the very least—demonstrate the potential when a community comes together as a whole to invest in the education of our children. What can be done? Why aren’t we doing it? Baldwin Promise: Offers up to $5,000 per year for four years to a four-year public or private university or at a community college. Battle Creek Promise: Offers tuition at Kellogg Community College. Bay Commitment of Bay City: Offers $2,000 per year toward a community college or public university. Benton Harbor Promise: Offers two years of tuition at a community college or four-year university. Challenge Scholars of Grand Rapids: Offers college scholarships that can be used at any Michigan public university, Grand Rapids Community College, Aquinas College, or Davenport University for high school graduates who attended Harrison Park or Westwood middle schools. The Detroit Scholarship Fund: Offers two years of tuition at metro-Detroit community colleges. Hazel Park Promise: Offers up to $2,000 per year for two years at a community college or four-year university. Holland-Zeeland Promise: Offers tuition and room & board to a community college or four-year university for low-income students who have demonstrated community service. Jackson Legacy Scholarship: Offers up to $1,000 toward tuition at Jackson College, Baker College of Jackson, or Spring Arbor College. Kalamazoo Promise: Offers tuition for Kalamazoo Public School graduates to attend community college, public university, or a number of private universities. Lansing Promise: Offers Lansing Public School graduates up to 65 credits at Lansing Community College (enough for an Associate’s Degree) or the financial equivalent at Michigan State University. Mason Promise: Offers two years of tuition at Lansing Community College for Mason Public School graduates. Muskegon Area Promise: Offers funding for up to an Associate’s Degree at Muskegon Community College or Baker College of Muskegon to students who graduate with a GPA of 3.5 or higher. Northport Promise: Offers up to $2,000 per year toward a community college or public university. Pontiac Promise: Offers up to the cost of the equivalent of an Associate’s Degree at a community college or four-year university. Saginaw Promise: Offers up to $2,727 per year to a community college or $8,000 per year to a four-year Michigan public or private university. List courtesy of Bridge Magazine and MLive. 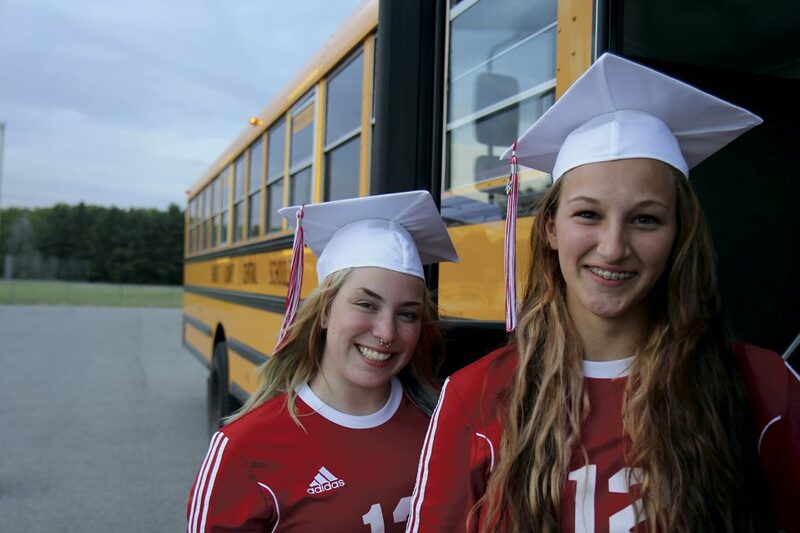 Photo caption: Benzie Central and Frankfort will graduate close to 150 students on Sunday, June 5. What if we could send them all off to college? Photo by Aubrey Ann Parker.